The Ellislab has discontinued the support for ExpressionEngine version 3 and announced the retirement of ExpressionEngine Version Version 4 on 16 Nov, 2019 from the market and then there will be no update and support from the officials. After this news all the care taker of EE4 Websites are worried for their Business and Websites. With the retirement of the EE3 and EE4, Ellislab had released the New Version of ExpressionEngine i.e EE5 on 19 Nov, 2018. So no one has to worry about the running system. EE 5 has brought many new feature, read the blog to know more about EE5 features. Although there are some Add-ons providers those have not upgraded the Add-ons to use with EE5. Some webmaster are facing problem because due the Add-on dependency on some functionality on website either they can delete that functionality or can use different add-on with same function. To use the different add-on will force you to purchase another one and if you will remove the functionality then it will affects the traffic. Here, W3care Technology provides ExpressionEngine module development and has come up with the solution to you where you don’t need to wait for the add-ons developers to upgrade the add-on you are using from them. The W3Care ExpressionEngine developers will upgrade ExpressionEngine website in EE5 for you and will upgrade ExpressionEngine Add-ons too. CartThrob, Freeform, Forum, Structure, WYGWAM editor, Multi-Site Manager, MX Google Map, LG Better Meta, File Manager, Imgsizer, LG htaccess generator, Fieldframe, MC Image Manager, Playa, LG Image Manager, Channel Images, Character Limit, Low’s Yearly Archive, Akismet, Google Analytics Panel, CP Analytics, SEO Lite, Channel Videos, Tags etc. 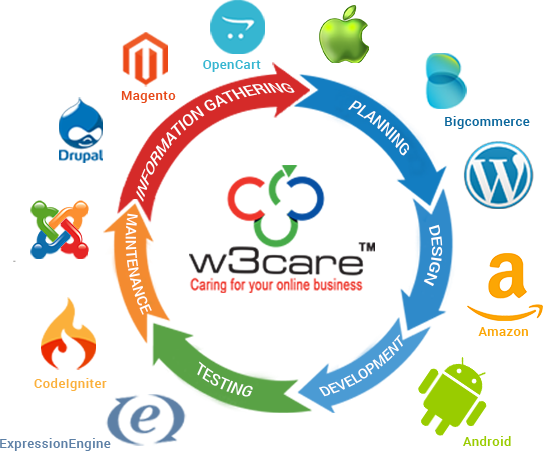 We at W3care Technologies have team of experts who work towards the client’s satisfaction and delight as our current success is all due to our high client contentment. we follow an advanced methodology to accomplish the given clients proposal with highly innovative and optimized end to end app development. We work towards providing consummate solution in rapports of quality, time and functionality. Once we spelled out all the details, they were able to complete most of the tasks. Their Communication, Cooperation and Availability were excellent.